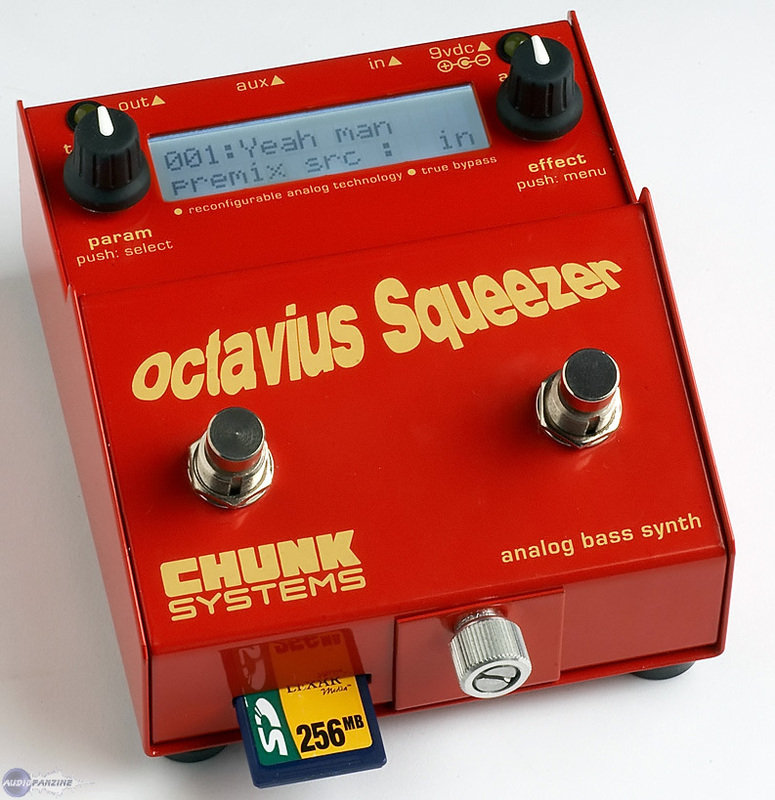 Octavius Squeezer, Other Bass Effect from Chunk Systems. Hold your breath, though, cos this little beauty will be out only at the end of August 2008. 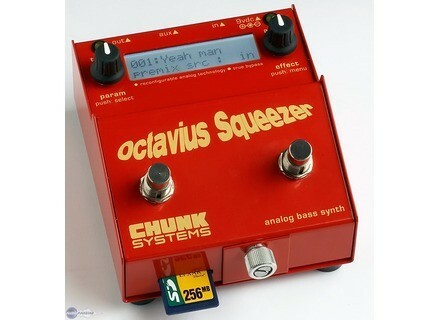 * Designed for bass guitar. * Wide range of synth, octave, envelope filter, fizz and other effects. * True bypass - input is connected directly to output by a mechanical relay when switched off. * True analog signal path with reconfigurable analog technology. * Over 50 digital onboard presets with bank organization for easy selection. * SD card socket allows you to save/load additional presets, upgrade firmware, etc. * Analog two pole lowpass and bandpass filter circuit. * Digital pitch tracking with advanced harmonic rejection. * One octave down, one octave up and two octaves up synthesis. * Runs from a single 9V battery or external power supply (not included). * Sturdy steel case finished in an eye-catching red. * Two user-assignable foot switches and two digital control knobs. * Backlit 2line,16 character LCD and blinking tempo LED. * Auxiliary output for click tracks and Agent OOFunk Mark II envelope input. * Metronome and beat-locked effects with tap tempo mode. Yamaha RBX5 A2 Yamaha Guitars is now shipping two new electric bass guitars that feature the company's proprietary A.I.R. (Alternative Internal Resonance) technology, which provides the sonic properties of a heavier, traditional-style instrument without the weight. Ibanez introduces Soundgear SR750&SR750 Ibanez presents the SR750 et SR755 bass guitars, two newcomers in the brand's Soundgear series. Electro-Harmonix Bass Metaphors In this year which will see the 40th anniversary of the brand's creation, Electro-Harmonix keeps introducing new bass products and presents the Bass Metaphor.